What have we done? More than half of U.S. citizens are convinced that climate change is now ravishing the planet as demon-strated by the wicked weather patterns and flooding worldwide. What will it take to convince the non-believers? Some will argue that these cycles have happened many times through-out the eons and they would be right. However, never in the history of mankind has there ever been such a significant increase in such a short time of a warming of our planet, much of which is due to the human species pumping carbon dioxide (CO2) into our atmosphere, otherwise known as greenhouse gasses. The one degree increase in global temperature is giving Earth a fever, just like it would in humans. The planet fights that fever with turbulent weather, its elixir to clean out the virus making it too hot in the first place. Human contribution of poisonous gasses, for which we are all responsible, is that virus. And the Earth always wins. 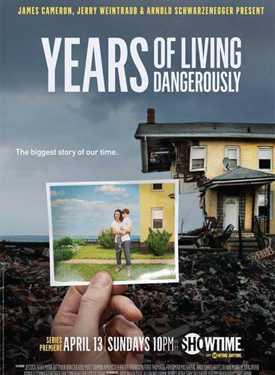 Please watch and listen (and include your children) to this new 'very important' documentary series about climate change, a call to arms if you will, Years of Living Dangerously by James Cameron and Arnold Schwarzenegger.